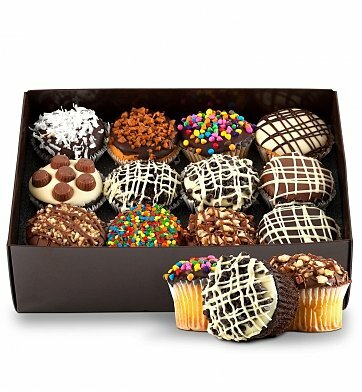 Amaze the cupcake lover with twelve cupcakes in assorted cake flavors, each hand-dipped into the chocolate topping of your choosing and lavishly decorated with a variety of toppings like peanut butter cups, Oreo cookie bits, toffee and more. It's a gift that the recipient will never forget! Hand decorated with candies, crushed cookies, and confections. One Dozen Ultimate Cupcakes is a hand delivered gift. These gifts are delivered by one of our local design centers located throughout the United States and Canada. Same day delivery is available for most gifts when ordered before the cutoff time. The cutoff time for One Dozen Ultimate Cupcakes is in the recipient's time zone. Hand dipped in Belgian chocolate and decorated with candies. My son loved the cupcakes. He is in the Army and we weren't able to celebrate his 21rst birthday. These were delivered on time during a hurricane! The only complaint is that the message I wrote to him was not included in the delivery. My initial order was shipped with the incorrect merchandise. I called customer service and they immediately expedited the correct item. The manner in which they handled this was professional and courteous. I will be using Gift Tree in the future for all my gift shipping needs. The cupcakes arrived quickly, and in attractive packaging. They taste of the cake was good, but the icing had poor texture and flavor. The recipients especially my grand kids loved them!! Will definitely keep them in mind for the next occasion.